Lindsay V. Mason focuses her practice on family law matters and has extensive litigation experience in the areas of divorce, complex asset valuation and division, child-related matters, post-divorce modification, enforcement of judgments, child support and prenuptial agreements. Ms. Mason has significant experience practicing family law at a sophisticated level including matters involving significant marital assets, complex business issues and sensitive child related concerns. Lindsay was formerly an associate with Ginsburg & Leshin, LLP, and Lee & Levine, LLP (now Lee & Rivers LLP). Previously, she was a law clerk for the Massachusetts Probate and Family Court, assisting the justices in divorce, contempt, modification, probate, trust, guardianship and equity matters. 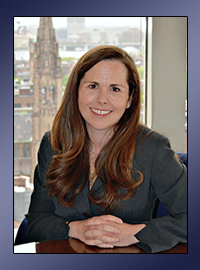 She is a member of the Massachusetts Family & Probate American Inn of Court, the Association of Family and Conciliation Courts and the Massachusetts Council on Family Mediation (MCFM). Ms. Mason is a 2004 graduate of The George Washington University Law School where she was Vice President of the Moot Court Board, and a 2000 graduate of Smith College. Ms. Mason has been selected several times by her peers for inclusion in Boston Magazine and Law & Politics, New England Rising Stars® for her work in family law. Ms. Mason is admitted to practice in Massachusetts.